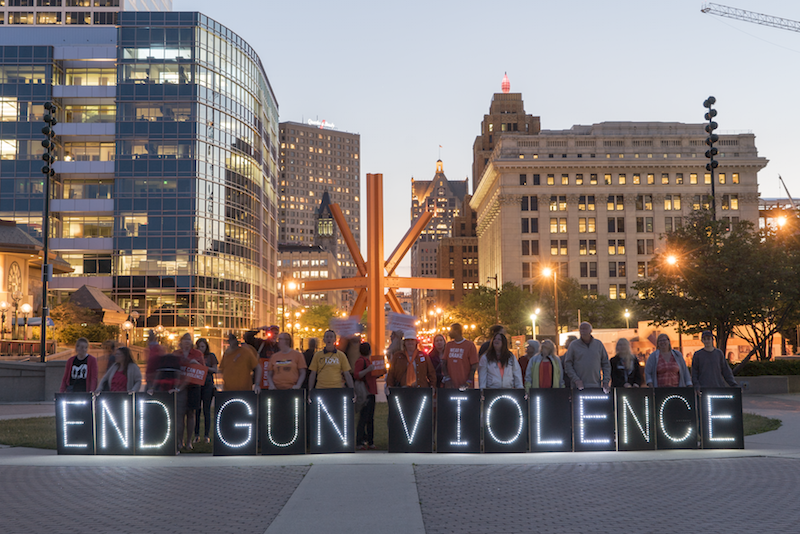 Demand action for gun sense in America (Photo: Joe Brusky). We at OLB discussed the writing of a small reaction piece to the dreadful massacre in Las Vegas. We balked, feeling numb to the anger, fear and violence of our times in the USA. “What is there to say,” we asked, “that hasn’t been said over and over hundreds of times?” But it has been eating at us all week, this numbness that we feel about the frequency of such violent acts, their interconnection with access to military style weaponry, and the intractable nature of our legislature regarding even common sense gun control measures. Background checks? Be real! Semi-automatic retrofits readily available on the web so you can jack your lethal weapon with caffeinated trigger twitch? DIY culture, baby! Bans on assault-style weapons? Not in my America! Armor piercing bullets? Of course, what is a gun without unlimited ammunition! This fear and hysteria is fostered by the armament industry’s lobby megaphone, the NRA. They suggest that even a slight curb on unlimited weaponry is a slippery slope to a dystopic future where only some ill defined power will have the use of force, and our well-armed militias, living locally, will be powerless and impotent against such dark forces of chaos and tyranny. 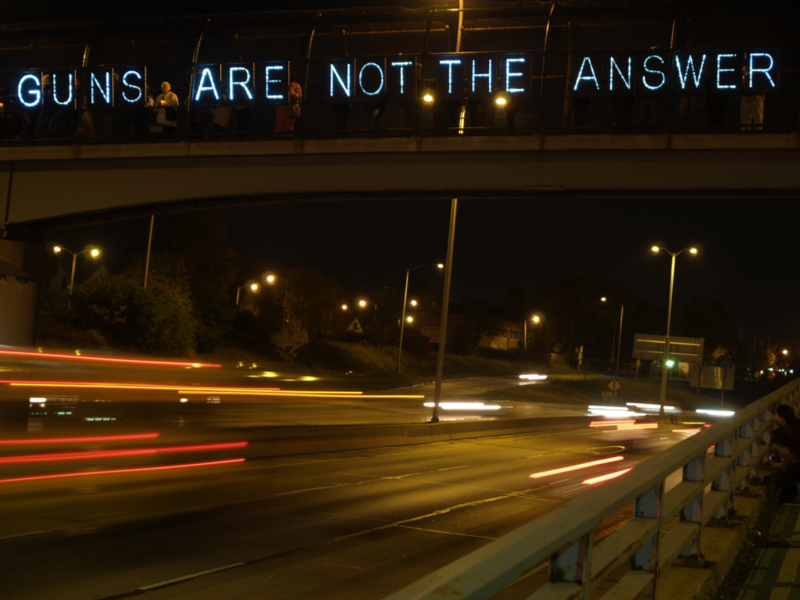 Ring Street Pedestrian Bridge message over I-43 in Milwaukee (Photo: Joe Brusky). But the fact is, there is a relationship between gun ownership and gun violence. This is well established. The NRA is a Death Cult, and we are all being held hostage. More guns in a community leads to more homicide. Period. In the USA, there are more than 11,200 gun homicides a year. Since Sandy Hook alone, there have been more than 1,300 mass shootings. Do we have the will to fight the NRA, and push against the duplicity of the totally purchased GOP, in order to demand responsible legislation regarding assault style weapons? 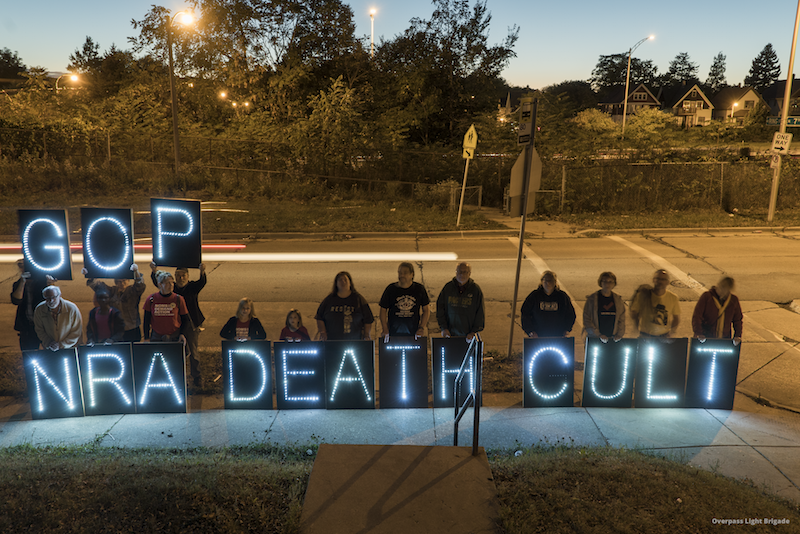 Message at a vigil in downtown Milwaukee in 2016 (Photo: Joe Brusky). The NRA wants us to believe that somehow saturating the world with guns makes it a more peaceful and safe place. There is no data to suggest this, only the wild fantasies of a scared, angry and violent people. We at OLB aren’t against gun ownership. Hunting and marksmanship are honorable activities when done with care and respect. We are against the easily available antipersonnel weaponry that saturates America. Semi-automatic retrofits and “legal” hacks essentially give military capability to the kook next door. This isn’t sane! Atkinson Avenue Pedestrian Bridge message in Milwaukee in 2012. So we cycle through yet another round of sanctimony, impotent prayers for the victims, vigils such as the many that we have conducted for Slaughters of the Innocents nearby and faraway. We are confronted by smug patriarchs who tell us that “now is not the time to talk about legislation,” and by deeply cynical politicians who somehow try to convince us that “it is inappropriate to politicize such tragedy.” We are corrected on our loose understanding of jargon (is that really a semi-automatic?) or our sloppy understanding of complex law (background checks in gun stores, but not gun shows? Would you like your open carry with or without license, sir?) and mostly we are told, directly or implicitly, to just shut up and move along. Nothing to see here folks, other than bullets raining down like Kansas hail on a peaceful and joyful crowd at a country music concert, while another “lone wolf” redefines animal behavior. 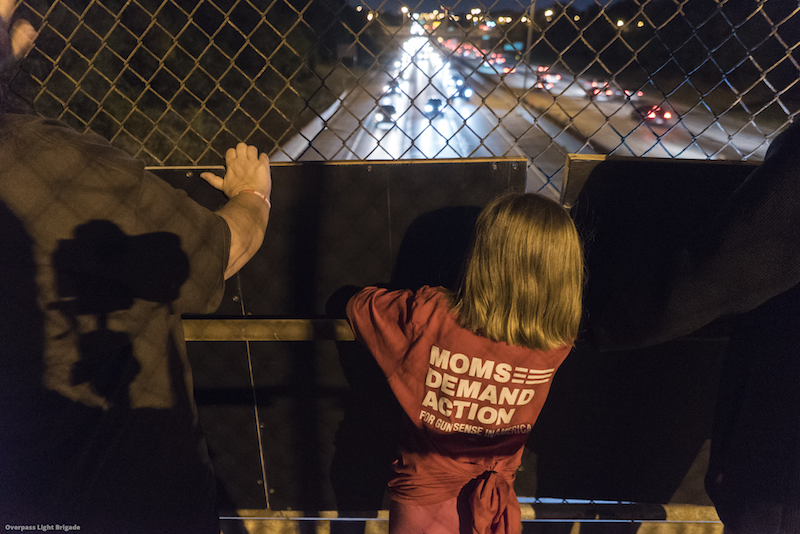 The NRA is a death cult, and we are all held hostage (Photo: Joe Brusky). And that brings us back to silence. Another week, another mass shooting. 1,300 since murdered children at Sandy Hook. Death Cult NRA. Death Cult GOP. Death Cult America. Duck and cover. The next attack is coming soon to a neighborhood near you. 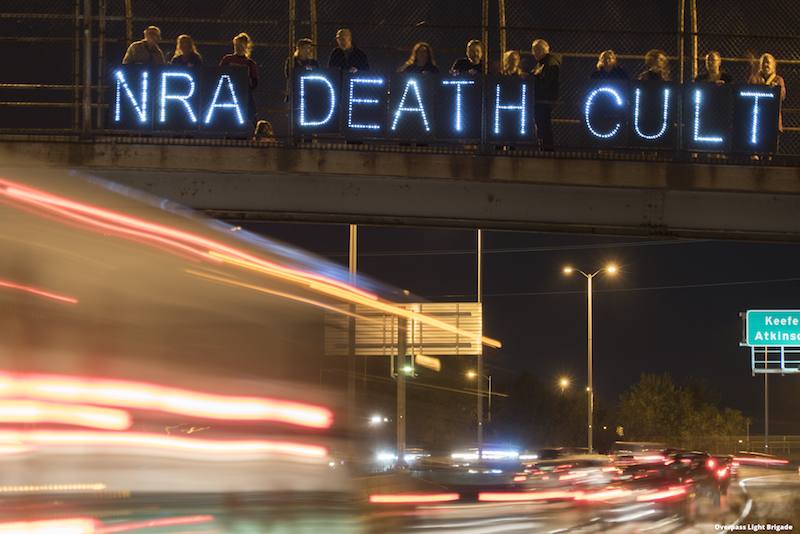 NRA Death Cult from Overpass Light Brigade on Vimeo.